Apart from Little Penguins, they have several common names. In Australia, they are also referred to as Fairy Penguins because of their tiny size. In New Zealand, they are also called Little Blue Penguins, or just Blue Penguins, owing to their slate-blue plumage, and they are called Kororā in Maori. Three men who allegedly stole a penguin from Sea World were nabbed because they boasted about it on Facebook. Sea World’s Trevor Long told ABC Radio that Dirk the fairy penguin was recovering at the Gold Coast marine park after he was stolen and released in the Broadwater on Saturday night. Staff were relieved to have an exhausted Dirk back, as was his penguin partner, Peaches. Dirk had no chance of surviving alone in the wild, Mr Long said. “It’s totally foreign to this animal and it’s very, very cruel,” he told ABC Radio on Monday. “He wouldn’t have survived in the wild, not at all. Dirk was hiding under the concrete of Southport pier and was very afraid and distressed when Sea World staff rescued him on Sunday night, Mr Long said. He said it was the first incidence of animal theft from Sea World, and was brought to the attention of police because the men allegedly revealed their crime on Facebook. A friend of the men then alerted police. Three men aged 18, 20 and 21, will appear in court next month charged with trespassing, and stealing and unlawfully keeping a protected animal, an offence under the Nature Conservation Act. Dirk, a fairy penguin at Sea World Dirk, a fairy penguin at Sea World on Queensland’s Gold Coast, has never been in the wild and is part of a breeding colony. Dirk has been reunited with his mate Peaches. Police allege three young men broke into Sea World on Queensland’s Gold Coast on Saturday night, swam in the dolphin enclosure and then stole seven-year-old Dirk as they made their escape. The little bird was found, exhausted but otherwise well, on Sunday after a couple spotted him in a nearby shallow estuary. “They heard a scuffle in the water, and this penguin came out onto the sand,” Sea World’s director of marine sciences Trevor Long told reporters. 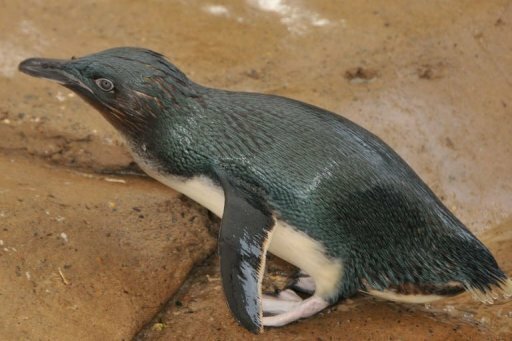 Long said the couple saw the captive-bred penguin get chased out of the water by another animal — possibly a shark — before it was then herded back in by a dog. Sea World workers eventually came to retrieve him. “Had we not got him it wouldn’t have been a good situation at all in the long term for Dirk,” Long said. “These penguins do mate for life and that’s why it was so important to get this bird back,” Long said. The three, aged 18, 20 and 21, have been charged with trespassing, stealing and unlawfully keeping a protected animal. They allegedly told police they released Dirk into the Broadwater, a waterway known for its sharks.